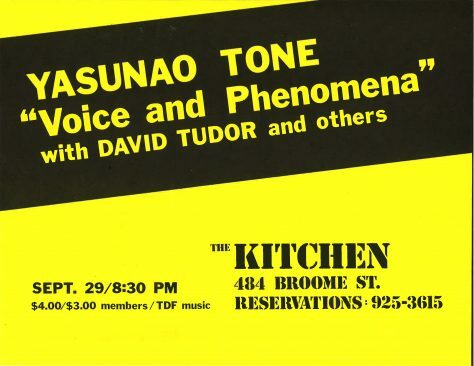 "Voice and Phenomena" was the concert of two works by Yasunao Tone, which took place September 29, 1979, at The Kitchen. The first piece, and namesake of the evening, "Voice and Phenomena" consisted of a grammatological performance. The Chinese character of three poems: "Den Jin Ling Fēng Huan T'ai," by Li-Po, "Jin Se," by Li Shan-yin, and "Gon Ci" by Po-Chu-Yi," were film projected, while being read by Mimi Johnson, Yasunao Tone, and Yoshiharu Suenobu. The second piece was "Music and Geography," performed by Tone, with David Tudor on piano, and Martin Kalve on the star-cloud (an instrument invented by Kalve). Tone read segments of stories from 8th-century Chinese texts, which he translated into English, while instrumentalist performed music Tone derived from the 8th-century pipa (lute) music.